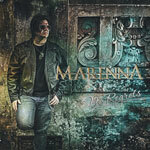 Marenna are a melodic AOR/hard rock band from Brazil formed in 2014 as a solo project by composer and vocalist Rodrigo Marenna. The band released the E.P. 'My Unconditional Faith' in 2015 and their first full length offering 'No More Regrets' in 2016. The bands second album, 'Livin' No Regrets', is a live recording, and was released in 2018. The AOR juggernaut that is Marenna continues to roll on, gathering momentum as it heads for success. After two releases in two years, Marenna now present their third offering, a live album, recorded in the city Caxias Do Sul, in Brazil during the No Regrets tour in 2016. Featuring all but one song from their first two releases, Marenna deliver a highly energetic performance, full of bombast and a party rock atmosphere. The listening experience is as if you were actually there, as the album has been released in the raw, so to speak, with no overdubs or obvious studio editing. 'You Need To Believe' launches the album straight into an AOR avalanche, transporting the sound of the eighties to the here and now. 'No Regrets' (the album) was a sparkling journey of AOR/melodic hard rock, and with this live performance, Marenna deliver exactly the same, just with more energy and excitement. Sixty minutes of hard hitting melodic hard rock, this album has it all. You have up tempo songs such as 'Fall In Love Again', 'Reason To Live' and the superb 'Can't Let You Go', sounding much more punchy than the studio version. The classic eighties AOR sound is served up with the catchy sing a long songs 'Keep On Dreaming', 'No Regrets' and the exquisite soft rocker 'Never Surrender'. The mellower songs on offer are 'Like An Angel' and 'Come Back', with a cracking performance of 'So Different', the ballad from the bands debut album. Restrained energy is bursting to break free, but Marenna expertly holds it in. 'So Different' is a definite lighters in the air and sway from side to side moment. Highlights off the album are the party rock anthem 'Forever', the glam rock swagger of 'About Love' and the new song, the AOR heavy 'Life Goes On'. 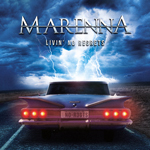 'Livin' No Regrets' is proof that Marenna are an excellent band in a live arena, delivering a breathless experience of catchy AOR and sing along able melodic hard rock. Overall, an avalanche of melodic hard rock/AOR, full of catchiness and infectiousness that will have you smiling and singing along from start to finish.